Charlotte Hodge, Bedlam's theatre manager, collecting the Award on behalf of the student-led venue in Edinburgh, said: "Receiving this award is a huge honour for Bedlam. We feel that sustainability is so important to the future of theatre as a whole. We have many ideas on how to improve but as a student-run theatre company we don't necessarily have the professional experience or the funds to know where to make a start on them. That is why this award is so important to us: it rewards our enthusiasm and our drive to make changes with the resources we have. This award will help us in our mission to make Bedlam Theatre a more sustainable venue for future members." Hodge continued: "Thanks must go to Edinburgh University and the Edinburgh University Students' Association for their support; to Creative Carbon Scotland and Harry Giles of Festivals Edinburgh for their advice; and to the many Bedlam members who have got us to this point, in particular Luciana Miu, Adam Alton, Bryn Jones and Ruth Luckins." 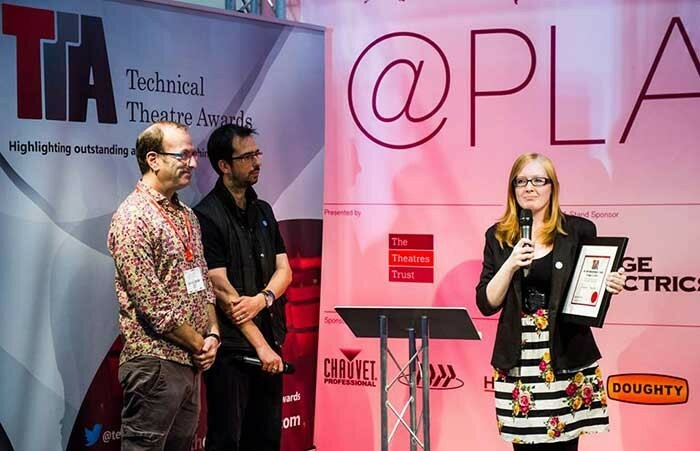 Tim Atkinson, technical director of :entertaining sustainability, the award sponsor, said: "Bedlam Theatre's team demonstrates once again that it is perfectly feasible to present uncompromising and exciting live entertainment whilst continually innovating and experimenting to reduce the residual impact of its operations." Atkinson continued: "By experimenting with initiatives such as electronic programmes, and collaborating with organisations such as Creative Carbon Scotland, Bedlam repeatedly pushes the envelope of what is achievable within their parameters. Most importantly, the team communicates their work with their audience - a crucial engagement - and with so many patrons at each performance, their message spreads quickly beyond the walls. Huge congratulations to them all." 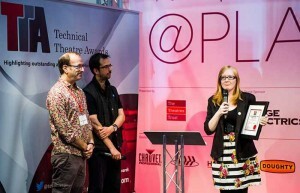 The Technical Theatre Awards has been established to recognise the achievements of backstage staff in production, and was given considerable industry support, not only by its host, Tony and Olivier Award-winning lighting entertaining sustainability.com designer and former chairman of the Association of Lighting Designers, Rick Fisher, but by the industry sponsors who supported each award. The full list of winners is: Paul Arditti, dBS Award for Outstanding Achivement in Sound; Tim Routledge, Philips Entertainment Award for Outstanding Achievement in Lighting; Ben Philips, AVW Award for Outstanding Achievement in Automation; Jonathan Hall, StageBitz Award for Outstanding Achievement in Prop Making; Chris Layton, PRG Award for Outstanding Achievement in Education; Megan Cassidy, IOGIG Ltd Award for Outstanding Achievement in Wardrobe; Adam Searle, Load Cell Rental Award for Outstanding Achievement in Flys and Rigging; Stefan Musch, The Theatres Trust Award for Outstanding Achievement in Wigs and Makeup; Sadler's Wells, Spotlight Accounting Award for Receiving Venue of the Year; Autograph Sound, AdVision Hire Company of the Year Award; Janet Williamson, Triple E Award for Outstanding Achievement in Building and Set Construction; Richard Bullimore, Lighting and Sound International Award for Outstanding Achievement in Production Management; Bedlam Theatre for the entertaining sustainability Award for Venue Sustainability.